Do these bottles look strangely familiar? They do to me! They look just the lovely salon line of products Bed Head. 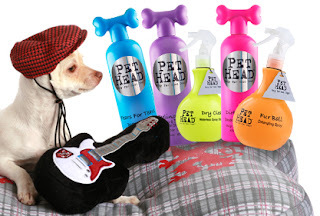 These are high quality pet products called Pet Head. I have seen them in pet shops and have wanted them for my pups for awhile now! Finally, I was sent some for review and got to try some of these great products. I had to include this picture from the website because it was way too cute not to! When I opened this package, my little guy Jaxen was so excited because he knew that it was for him. He literally jumped into the shower with me so I decided to give him a bath with this Dirty Talk shampoo. It smells great and deodorizes (thank god!). Jaxen smelled amazing after and still does two days later. I also got to review the Fears for Tears shampoo which also smells awesome. Thanks for helping my stinky puppy get clean in a jiffy and smell so sweet.